Despite it’s Brummie pedigree and a so-good-it’s-almost over the top quote from Jonathan Coe (who I think is brilliant) on the front I wasn’t in the mood for this book. It was not about to get an easy ride, as I hadn’t got an easy ride driving back from its launch party when some sod of a 4×4 driver smashed into our tiny box, giving me a horrendously aching back and making every page-turn agony. Even with the engaging humans, and one taciturn cloth simian, the main character is ‘Green Oaks’ shopping centre (recognisably Merry Hill) and the mass of meat that frequents its chain-stores and hidden depths. No sooner do we get attached to Kate the wonderfully ten-year-old detective, who is engrossed with her surveillance of anyone and everything in the centre, than we lose her and are transported forward twenty years to Kurt whose job that really is and who is far from engrossed in anything. For me the main theme is the shopping centre as gravitational force, there isn’t anyone in the book, even the walk-on part of the eighties butcher, who isn’t sucked into it’s thrawl. Even though Kurt, Lisa, Kate and accompanying cast are the refuseniks of the commercial world it’s Green Oaks that is pulling the strings, expanding and consuming them. It’s Romero’s Dawn of the Dead with Nice ‘n’ Spicy Nik Naks, and without zombies of course. Both sides of the two-decade timeshift are observed with great attention to detail, without feeling the weight of its pop-cultural references like so many modern novels. Did Queen have a heavily promoted Greatest Hits out in 2004? If they didn’t it seems like they did anyway. 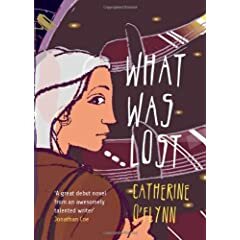 Catherine perfectly captures the world of the bookish eighties child, setting up offices with plastic typewriters – for me it was newspapers rather than detective agencies – and I would have happily followed Kate and Mickey the Monkey for the whole journey. The sense of loss of innocence from the narrative intertwines with the loss of the girl, something bad must have happened in the intervening twenty years. I don’t just mean Thatcher, Blair and the rise of the out of town shopping centre. I forgot how much it hurt to laugh and let myself, I tore through it in a sitting, it’s a great read. Could do with more about the lift-shitter. Catherine O’Flynn will be at ‘The Stratford-upon-Avon International Festival of Literature’ on Friday 18th April, 2008, at 7.30pm. The festival venue is the Mercure Shakespeare Hotel.